I’ve never really had high blood pressure. When I was young and fit, it was on the low side. As I got older and fatter it did go higher. Last year, it had averaged 122/80 or so with a pulse rate of just under 80. I had a routine appointment with my doctor last week. The nurse said my blood pressure was 80/60. I forgot to ask about pulse rate. I thought that number seemed wrong, so I went to the drug store and used the machine. 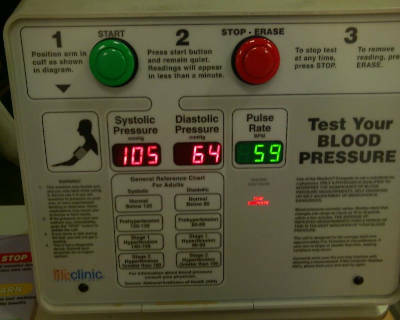 According to the machine it was 105/64 with a pulse rate of 59. Although this is a bit higher than at the doctor’s office, it is a bit more in line with what I thought it should be. This is why I’m losing weight and eating healthier. I want to have a long and healthy life. Good for you David. 2009 may be finally be my year to say “No”. You’re already doing half of it. Do the other half (changing the eating habits), and it’ll come. It can be hard, and it’s okay to let loose and eat whatever you want sometimes, but the results are *so* worth it. I feel better now than any other time in my adult life.